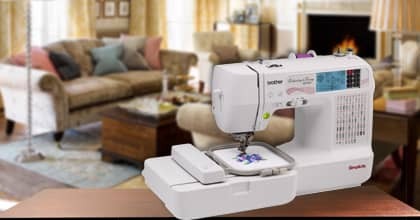 Add beautiful embellishments to your runway ready looks with the new Simplicity® by Brother™ SB7500 combination sewing and embroidery machine. This powerful machine is loaded with high-end features at a simply affordable price. Jazz up your wardrobe with 70 built-in embroidery designs and 100 designs on an included CD. 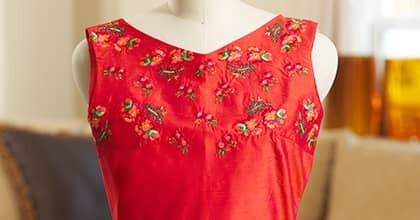 You also have access to over 5,000 embroidery designs at iBroidery.com. Enjoy the easy to-use, large, back-lit LCD touch screen display. The advanced needle threading system and push button thread cutter will make embroidery fun and easy. Let your creativity explode with simply original combination sewing and embroidery machine. Please call us for more information and pricing. 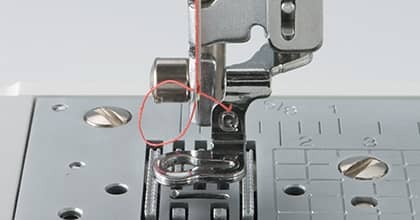 Machine Dimensions (H x W x D) 10.94" x 6.89" x 15.55"
Shipping Dimensions (H x W x D) 15.15" x 17.71" x 20.27"
· Presser Feet: 20% off all sewing machine feet within one year of machine purchase. · Trade-In: 100% trade-in value from your previous EQB machine purchase. Good toward any list-price new machine upgrade within 12 months of original purchase (Six months for Babylock sergers) Trade-in must be in “like-new” condition, returned the way it was sold and routinely serviced, certain models excluded. · Sewing Studio: Cabinet savings, 20% off any cabinet (delivery and assembly available). · Gift Certificates: Up to $50 gift certificate for referring friends. Let someone who is new to us know where to buy a machine, remind them to give us your name, then you will receive a “Thank You” gift certificate good towards any EQB merchandise. · Repair: Factory authorized repairs. Only our authorized, factory-trained, and always current service technicians will do all warranty work. · Customer Service: Friendly, knowledgeable, efficient service. *Semi-commercial/commercial & used machines excluded. **Refundable registration fee will be charged at time of each class signup.